25 million automobiles were produced in India in the year 2017. Fourth largest commercial vehicle market in the world. Total production volume grew at a CAGR of 5.9 per cent between FY12-17. 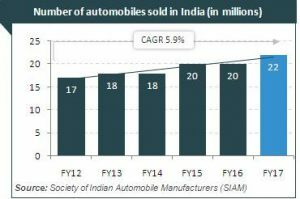 Trends in Auto Industry are very promising and is poised for further growth and be no. 1 in all areas. Government of India is committed to provide all support to this growing Industry. We, at Aimil, leading Instrumentation supplier in India, since 1932, is committed to contribute to the Auto Industry, by providing leading edge technologies and optimal product services in the field of Noise, Vibration & Harshness. We understand Industryâ€™s need to manufacture Quality vehicles and faster R&D Developments in todays competitive world. We provide variety of Instruments in the areas of Engine & Gear Box development and testing, high end analysers, data loggers and software to capture, analyse and represent data in customer friendly formats and many more solutions. We are proud to be part of endeavors of Auto Industry to be no. 1. Grow to be the Largest. ← Why Consumers today value more Comfortable Car Seats?